Even though the trailer for the Julie and Julia movie definitely had the feel of a “chick flick”, Bob and Kent agreed to go with Sonia and I to see it the other night. I wasn’t sure what we would think after reading this article in the Los Angeles Times — the writer knew Julia Child personally and has some interesting scoop about what she thought of Julie Powell. We laughed out loud several times! Meryl Streep was phenomenal, as expected. And Kent, Bob and Sonia agreed that the Julia Child parts of the film were more entertaining (she’s just so lovable! ), and that Julie Powell’s character was a bit pathetic at times; but they did think that the way the scenes went back and forth between the two women’s lives was interesting and done well. I, however, enjoyed both aspects of the film equally. But Julie Powell appealed to me as well. First, she also had a super-sweet husband who was as patient as mine is with my blogging, but here was the biggest thing: she was REAL and made me feel normal for not always keeping it all together! I don’t often share this with you, my reader friends, but this blogging stuff is not easy at times. I, too, have bawled my eyes out when the latest glitch wiped away a post I’d just worked hours on. I, too, mess up recipes often (I’m really not a great cook), but that usually will bring on the cursing under my breath more than the bawling. So while blogging definitely has its good points and can be a lot of fun (like meeting YOU from all over the world! ), I like that Julie didn’t make it out to always be a sparkly experience! Now, having said all that, I just took a look at the “Julie & Julia Project” blog (which inspired the whole movie) and was utterly unimpressed. Granted, I didn’t go very deep into it, so keep that in mind, but anytime someone has to swear using God’s name (aren’t there enough other options without using those words? ), I’m turned off immediately; but also the whiny attitude comes through more there than it did in the movie. So my advice is to definitely see the movie, but skip the blog. Did you see the Julie and Julia Movie? Please tell us what you thought! Get the Julie and Julia movie here. Kent said he remembers watching Julia Child’s show when he was a kid, but unfortunately we never did. 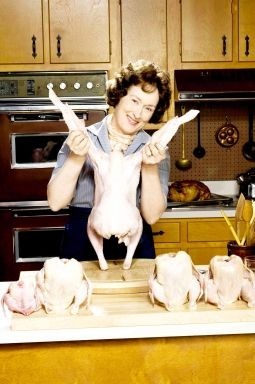 Now that I’m completely hooked on her, though, I’m adding these to my wish list: Julia Child Books . Also see this letter written by Jeanmarie to Nora Ephron! 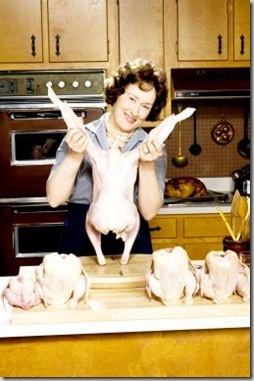 If you're like me and can't get enough Julia Child these days, check out these cute quotes and clips! I saw the movie, and I also loved it. I also read Ann Marie’s review and was hoping I would disagree. I see her point, but I was able to enjoy it anyway. I haven’t checked out the blog, but it doesn’t sound like I’m missing much. I’m now writing to her to tell her how much I loved the movie and how it’s ok to eat butter! Jeanmarie, yes!! Someone has to tell them! I also saw Meryl Streep on an interview saying something about gaining a little weight while shooting, I wanted to ask her what Sally Fallon asks when the issue of calories in butter comes up: what are you putting the butter ON?! I finally saw Julie & Julia today and I laughed and cried through the whole thing. I didn’t much like Julie’s persona in the book, but casting Amy Adams was a smart decision; she’s one of the most sympathetic actresses out there. The early scenes giving a taste of what she was going through at work also made her character more understandable. But Meryl Streep was truly exquisite, and her and Stanley Tucci’s portrayal of such a wonderful marriage was just breathtaking. How lovely to see how people who love each other — and like each other — treat each other. What a delightful movie. I look forward to seeing it again on DVD; I hope they pack it full of special features! I heard the director, Nora Ephron, being interviewed on NPR yesterday and they were talking about all the butter. She said something about, who knows, maybe someday there’ll be a big headline telling us that butter isn’t so bad for us after all. Nora, the headlines are out there! Did you never hear of Good Calories, Bad Calories, by Gary Taubes, a science writer for the New York Times Magazine? How could a New Yorker miss that?? I thought of looking her address up on IMDB and telling her about Weston A. Price, Sally Fallon and Kelly the Kitchen Kop! I just saw the movie with my husband and another couple. We loved it! I had read parts of the Julie/Julia blog when all the publicity came out – I really didn’t like the blog – especially the profanity – so unnecessary. However, I did like the movie a lot – and I wasn’t sure I’d like the Julie Powell part, but I did like that too. Thankfully the movie cleaned up her language. I really enjoyed the marriage relationships portrayed in the movie – I definite thumbs up! I really want to see this but rarely get to go to movies. I think it will be a very hard sell to the hubby. Gotta grab some girlfriends and go!! My two (blogging) girlfriends and I went to see the movie last night and really, REALLY liked it! Don’t read the blog or the book before you see the movie. Just appreciate the character of Julie in the movie – very well done! And Meryl Streep as Julia Child was perfect! This movie was inspiring. It made me want to be a more creative cook and it made me appreciate the sweetness of being married a LONG time (27 years for me) to a good man – What a great movie to see with girlfriends! Thanks for sharing your review! I just saw it last night with another blogging friend. I enjoyed it – especially Meryl Streep’s performance. I was curious about some of the backstory, so I appreciate the links you shared. I really enjoyed the movie. Of course, blogging and food are near to my heart, but my own hubby an editor and writer, so there was even more that felt close to home for me. Since “doing time” in the entertainment industry, I go out of my way to avoid sullying my movie-going experience with the views of Los Angeles journalists. Many have conflicts of interest (some financial) and some consider themselves the very key to a movie’s success (or failure.) Bah. I did visit The Project blog after seeing the movie and was most unimpressed. You are so right: the use of profanity was unnecessary. A writer has many tools at their disposal, this laziness of expression should not have to be relied on regularly. I am glad the movie wrote Powell as a more innocent creature. 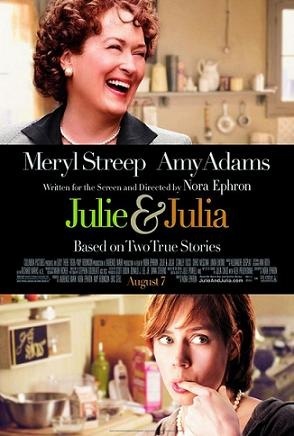 To be quite honest, I think one of the problems men have with this film is seeing Julia Child as a woman. She’s such an easy target for ridicule with her odd mannerisms, surreal voice and oversized frame. The idea of her having a normal physical relationship with her husband probably threw most of the male film reviewers for an irretrievable loop! And I’m so glad it did. Normal marriages are so seldom portrayed on film and yes, even those of us with oversized frames are worth loving. I want to go see this movie but the summer is packed with BBQs, engagement parties and life that is has been difficult. Now that I saw your post I will make time and get a grandparent babysitter and go see it with or without Eddy. Thanks for the clip! I haven’t seen the movie yet but I’ll go now, for sure. I read the book, and Julie Powell is not very likable, based on the book (haven’t seen the blog itself, don’t plan to). But you have to hand it to her for being open about her shortcomings. No false modesty there! You really wonder why her husband is with her. I found the book hard to get into yet somehow it became compelling to me to read her story. I can’t exactly recommend the book (she is so damned whiney) yet I was sorry for it to end. I read it in 2-3 days. I haven’t seen the movie (or read the book), but I did visit a link given to her blog from a review on another site. I was a bit turned off by some of things I read and the overall tone of the blog. I probably shouldn’t have visited the blog first, because now I have no interest in seeing the movie! Although I will probably pick up some Julia Child books at the library. I liked the movie, too, because first and foremost, it was a movie about blogging!